Russian star Alexander Povetkin and his team feel it will be a fight with WBA/IBF/WBO heavyweight champ Anthony Joshua next. Povetkin, the WBA mandatory contender, is sure he has what it takes to topple the unbeaten UK superstar. Povetkin’s promoter, Andrey Ryabinskiy, told Sky Sports how he feels Joshua will “do the right thing” and fulfil his obligation with the WBA and defend against the former WBA champ next. The promoter added how Povetkin would be more than happy to come to England for the fight, or maybe it could take place at a big arena in Russia: “It has to happen,” Ryabinskiy stated. With no current movement on a deal between Joshua and WBC heavyweight king Deontay Wilder (Hearn is reportedly scheduled to meet with Lou DiBella and Al Haymon in New York this week, so hopefully a deal can be thrashed out for the fight we all want to see), maybe AJ will indeed look to take care of his WBA obligation next. 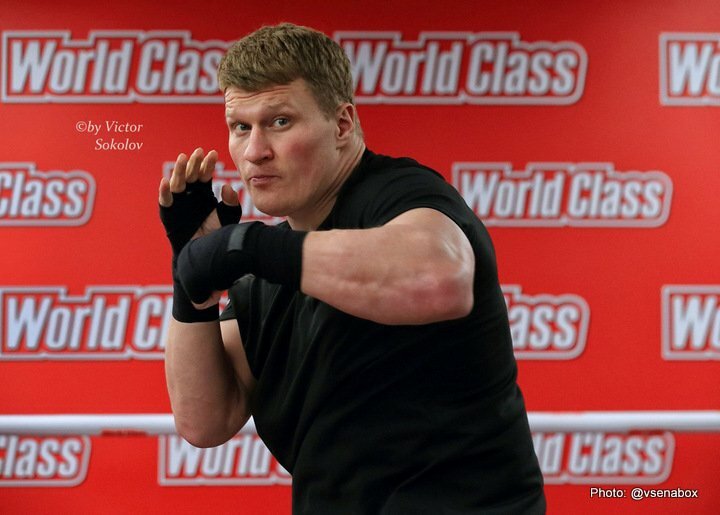 Povetkin, as experienced as can be at age 38 (beaten only by Wladimir Klitschko, via lopsided decision) has had his out of the ring issues (fights scrapped due to testing positive for banned substances) but the fact remains he is one of the most dangerous heavyweights in the world today. There will be plenty of fans willing to give Povetkin a great shot at beating Joshua should they fight next. If AJ does take him on next and manages to become the first man to KO Povetkin, then Joshua’s development and stature as heavyweight ruler will grow significantly. Fans would of course much prefer to see Joshua-Wilder next, but Joshua-Povetkin is not a bad fight at all.